Every community is unique, and that’s certainly true in Shelby County, Alabama. Thomas Grant Underwood, or simply Mr. Underwood, as most of his neighbors in Alabaster’s Lake Forest community called him, certainly helped make his neighborhood unique. 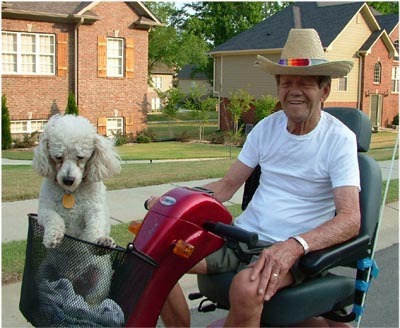 Seated in his electric mobile scooter, Mr. Underwood, along with his poodle, Scooter, always riding in the basket, were a frequent sight along the streets of Lake Forest. The two would ride around the neighborhood, taking in the nice weather and stopping to visit with neighbors, catching up on the latest community news. Scooter loved the excursions. From his years as a small puppy when he was swallowed up by the huge basket, to more recent times when he just about filled it beyond capacity, Mr. Underwood’s four-legged friend was always a constant travel companion. Mr. Underwood, 83, passed away March 24, 2008. People living in Lake Forest will always carry fond memories of seeing Mr. Underwood and Scooter casually meandering the neighborhood, and stopping to chat. They were part of what make the place we call home so special. To sell or not to sell…. Yesterday, a nice couple came to an Open House I was holding for a client. 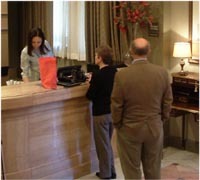 They explained that they loved the house, but they needed to sell their home in Chelsea before buying. When I asked them if their house was on the market, they said, “not yet.” They are in the process of trying to get it ready to sell. It apparently needs new carpeting, but they had decided to tell prospective buyers that they will replace it. They went on to say that, due to what they hear in the news, they’re thinking that it may be wise to wait a year or two to sell. I explained to them that homes in Shelby County really are selling. There is no room for homes in poor condition or errors in pricing, I said. So I suggested that they go ahead and replace that carpeting now, clear the clutter, and make certain the price is right. I wished them the best of luck. I hope they take my advice to heart. There is nothing more frustrating than to have your house for sale for months and months. A quick sale is still possible, even in this market. Nearly a third of employers in the area say they expect to hire more workers during the second quarter of 2008. That’s according to a Manpower Employment Outlook Survey. The survey is released quarterly to measure employers’ intentions to increase or decrease the number of employees in their workforce during the next quarter. According to the latest survey, 33% of companies in the Birmingham area expect to hire more employees during the April-June time frame. More than half of the firms surveyed (57%) said they plan to maintain current staffing levels, while 3% expected to reduce their workforces. The second quarter 2008 outlook is brighter than that of the same period in 2007, when 30% of companies said they planned to increase the size of their staffs, and 7% of employers planned to trim workers. This just helps to reinforce what most folks in the Birmingham and Shelby County areas already know: The economy in this area remains healthy!